Almond, J. E. 1985. The Silurian-Devonian fossil record of the Myriapoda. Philosophical Transactions of the Royal Society London Series B 309:227-238. Borucki, H. 1996. Evolution und phylogenetisches System der Chilopoda (Mandibulata, Tracheata). Verhandlungen des Naturwissenschaftlichen Vereins Hamburg 35:95-226. Dohle, W. 1985. Phylogenetic pathways in the Chilopoda. Bijdragen tot de Dierkunde 55:55-66. Dohle, W. 1990. Some observations on morphology and affinities of Craterostigmus tasmanianus (Chilopoda). Pages 69-79 in Proceedings of the 7th International Congress of Myriapodology. A. Minelli, ed. Brill, Leiden. Edgecombe, G. D. 2007. Centipede systematics: progress and problems. Pages 327-341 in: Zhang, Z.-Q. & Shear, W.A., eds. Linnaeus Tercentenary: Progress in Invertebrate Taxonomy. Zootaxa 1668:1–766. Edgecombe, G. D. and G. Giribet. 2002. Myriapod phylogeny and the relationships of Chilopoda. Pages 143-168 in Biodiversidad, Taxonomía y Biogeografia de Artrópodos de México: Hacia una Síntesis de su Conocimiento. J. Llorente Bousquets and J. J. Morrone, eds. Prensas de Ciencias, Universidad Nacional Autónoma de México. Edgecombe, G. D. and G. Giribet. 2004. Adding mitochondrial sequence data (16S rRNA and cytochrome c oxidase subunit I) to the phylogeny of centipedes (Myriapoda: Chilopoda): an analysis of morphology and four molecular loci. Journal of Zoological Systematics & Evolutionary Research 42(2):89-134. Edgecombe, G. D. and G. Giribet. 2007. 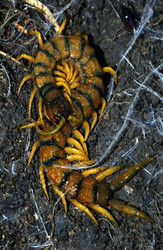 Evolutionary biology of centipedes (Myriapoda: Chilopoda). Annual Review of Entomology 52:1-151. Edgecombe, G. D., G. Giribet and W. C. Wheeler. 1999. Phylogeny of Chilopoda: Combining 18S and 28S rRNA sequences and morphology. Pages 293-331 in Evolución y Filogenia de Arthropoda. A. Melic, J. J. de Haro, M. Mendez and I. Ribera. eds. Boletín de la Sociedad Entomológica Aragonesa 26. Edgecombe, G. D., G. Giribet, and W. C. Wheeler. 2002. Phylogeny of Henicopidae (Chilopoda : Lithobiomorpha): a combined analysis of morphology and five molecular loci. Systematic Entomology 27:31-64. Giribet, G., S. Carranza, M. Riutort, J. Baguña, and C. Ribera. 1999. Internal phylogeny of the Chilopoda (Myriapoda, Arthropoda) using complete 18S rDNA and partial 28S rDNA sequences. Philosophical Transactions of the Royal Society London Series B 354:215-222. Giribet, G. and G. D. Edgecombe. 2006. Conflict between datasets and phylogeny of centipedes: an analysis based on seven genes and morphology. Proceedings of the Royal Society Series B 273:531-538. Jeram, A. J., P. A. Selden, and D. Edwards. 1990. Land animals in the Silurian: arachnids and myriapods from Shropshire, England. Science 250:658-661. Lewis, J. G. E. 1981. 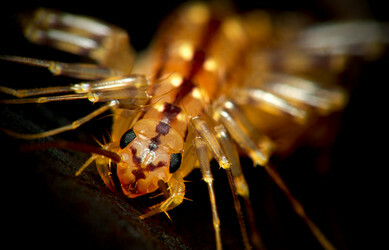 The Biology of Centipedes. Cambridge University Press, Cambridge. Minelli, A. 1993. Chilopoda. Pages 57-114 in Microscopic Anatomy of Invertebrates. Volume 12. Onychophora, Chilopoda and lesser Protostomata. F. W. Harrison and M. E. Rice, eds. Wiley-Liss, New York, Chichester, Weinheim, Brisbane, Singapore, Toronto. Mundel, P. 1979. 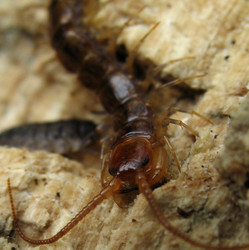 The centipedes (Chilopoda) of the Mazon Creek. Pages 361-378 in Mazon Creek Fossils. M. H. Nitecki, ed. Academic Press, NewYork. Prunescu, C. C. 1996. Plesiomorphic and apomorphic characters states in the class Chilopoda. Mémoires du Museum National d'Histoire Naturelle Serie A 169:299-306. Shear, W. A. and P. M. Bonamo. 1988. Devonobiomorpha, a new order of centipedes (Chilopoda) from the middle Devonian of Gilboa, NewYork State, USA, and the phylogeny of centipede orders. American Museum Novitates 2927:1-30. Shear, W. A. and P. M. Bonamo. 1990. Fossil centipedes from the Devonian of New York State, USA. Pages 89-96 in Proceedings of the 7th International Congress of Myriapodology. A. Minelli, ed. Brill, Leiden. Wirkner, C. S. and G. Pass. 2002. The circulatory system in Chilopoda: functional morphology and phylogenetic aspects. Acta Zoologica 83:193-202. Centipedes. Greg Edgecombe, Australian Museum online. Centre International de Myriapodologie. International Society of Myriapodology and Onychophorology. Page: Tree of Life Chilopoda. Centipedes. The TEXT of this page is licensed under the Creative Commons Attribution-NonCommercial License - Version 3.0. Note that images and other media featured on this page are each governed by their own license, and they may or may not be available for reuse. Click on an image or a media link to access the media data window, which provides the relevant licensing information. For the general terms and conditions of ToL material reuse and redistribution, please see the Tree of Life Copyright Policies.